Beautiful apartment situated in Panormos fishing village in the famous island of Tinos. 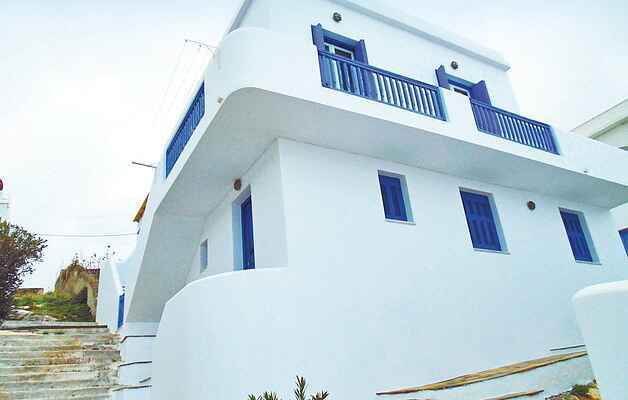 It is on the first floor and it is built with the traditional architectural style of the Cyclades islands with the most common characteristic to be the white washed houses built next to and on top of one another. It has 3 bedrooms and it can accommodate up to 5 persons. Sit on the balcony and enjoy your breakfast or a drink watching the amazing sea view. The beach is within walking distance from the house so you can swim all day long. Panormos village has a unique natural harbor and around the port you will find many restaurants to taste the traditional Greek cuisine. Near the village you will find plenty beaches to explore with the most famous to be Rohari beach. Do not miss to visit the Chora of Tinos where you can see the famous church of Panagia Evangelistria and you will have plenty of choices for taverns, coffee bars, souvenir shops and night clubs.